Navratri, once you strip it of its patriarchal trappings, is an empowering festival celebrating the Mother Goddess. Each day, her various attributes (a daughter, a mother, a wife, a warrior, an intellectual, as an unfettered free spirit etc.) are explored and worshiped. and the food offering invariably is a protein rich Sundal made with various lentils - a meat substitute, a nod to a pre-Buddhist era when meat was an accepted part of Hinduism. Back to the resolutions.. you'd have to have been living in a cave this past year not to have been made aware of how subtly misogynistic society (after the 2016 US elections) can be (worldwide), and yet camouflage it under the cloak of 'cultural sanskriti'. If you defend your factually accurate POV against an older male who spews nonsense on social media, boom, you're being disrespectful an deserved to be lectured on accepting 'other' points of view, however wrong it may be. skimp on the phony niceties that borderline narcissistic seniors feel entitled to.. you lack culture . When women break out of the mold, they're branded with .. oh I don't know, take your pick of negative adjectives, characterless, uncultured. Wait, I take that back, even if a girl chooses to stay in the box, there will invariably someone around her whose ego is bruised by her very breath. Raise a polite objection about it to the spouse, only to be gaslighted and told that she's being over sensitive and making stuff up. I find humor to be a good, nay GREAT way to get past the 'cultural abrasion' we've been told to put up with and even cherish. Its no fun to express happiness and bonding with the husband's family after they've just pronounced uncalled for & mean self righteous comparative judgments about one's children. Since the 'slight' is anyways 'imagined', the standard 'all persons fictitious disclaimer' ought to apply if and when such incidents are mentioned in print and in conversation. Wonder how that would work! Anyone who's read Twinkle Khanna's columns & book, Mrs. Funnybones certainly had a valid point when she quoted in her book. 'God could not be everywhere, so he created mothers, and the devil couldn't be everywhere so he created MILS'!! My paternal grandmother was incredibly intelligent and smart. As was the norm 80 years ago in India, she was married off at 14 , with barely an 8th grade education, and had her first baby when she herself was no more than a child of 16. She had an eye for perfection & zero tolerance for mediocrity, well versed classical music, fluent in 1/2 a dozen languages including English. She had an insatiable appetite for learning new things and would stop right in the middle of her tracks if an opportunity to learn popped up. Although she did give my mother classic MIL style grief during her lifetime, this thirst for knowledge and generosity in sharing it without hesitation more than made up for her somewhat flawed innate self centered personality. My mother learned the basics of cooking from her MIL rather than from her own mother. It was quite a coincidence that the same week my recipe for tomato relish was tested & posted on Food52, I stumbled upon her recipe for the same condiment written down half a century ago. I can't read Tamil, but some of my blogging buddies can & they love the conversational way her recipes were jotted down. One of my annual traditions these past few years has been to can batches of traditional Indian condiments and Pasta sauce for the entire year. 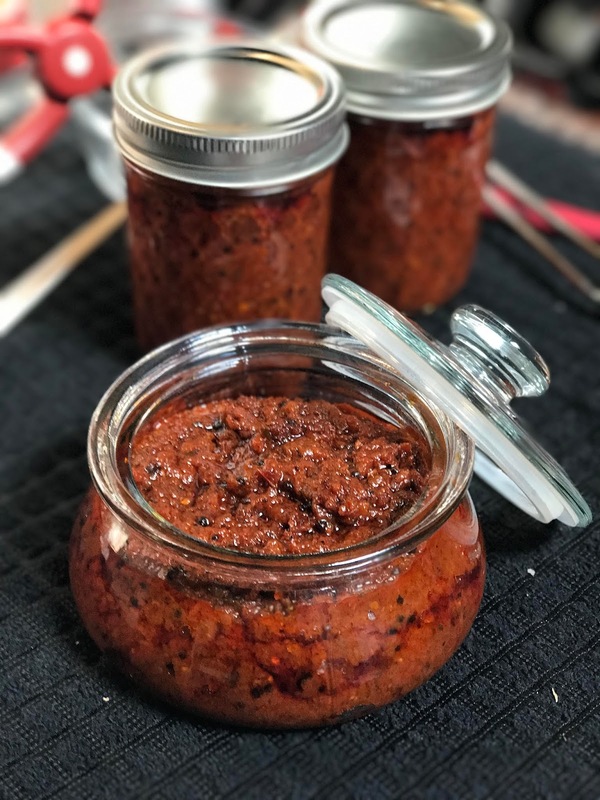 Although my recipe for this relish is already posted in the blog, I realize I have never posted the recipe for large quantities meant to be canned and stored for up to a year. 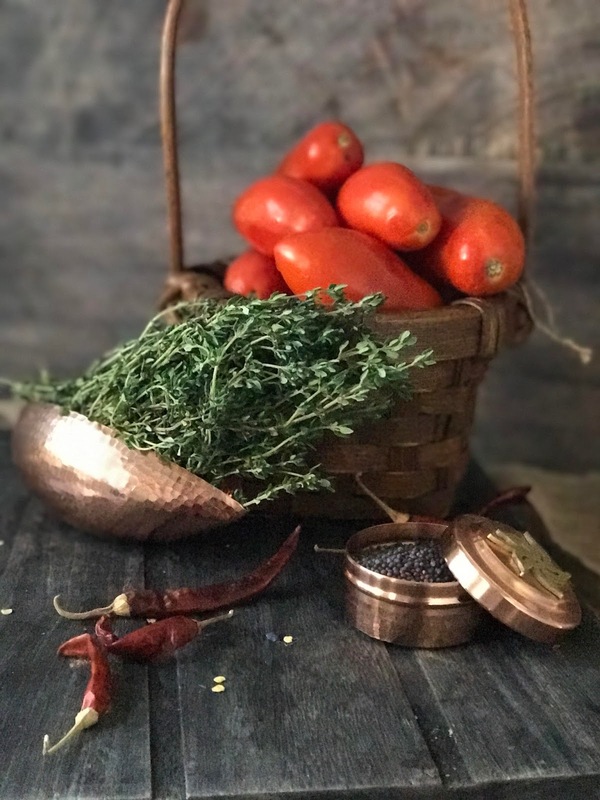 I had made multiple batches last year experimenting with various flavors and this thyme version turned out to be the family favorite. 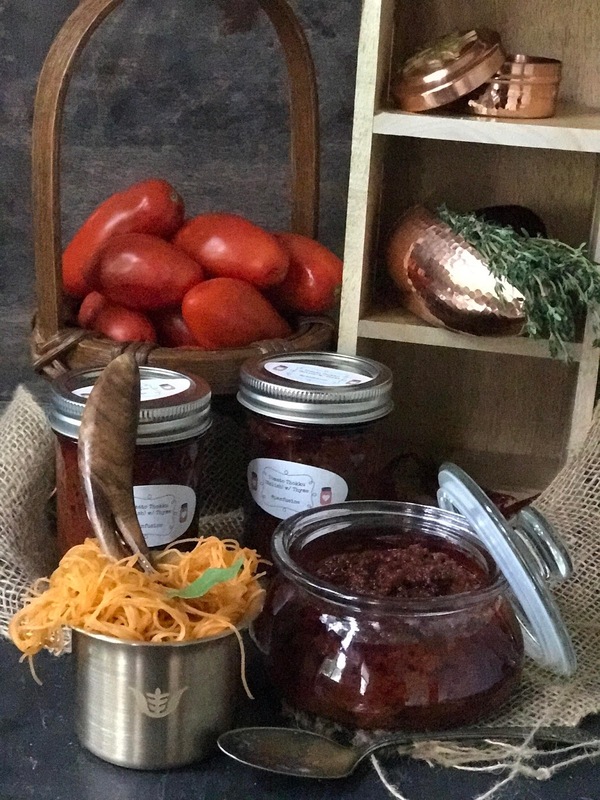 I source my plum tomatoes from my local 'farm around the corner' - Hillsboro Farm country market. 12-14 arbol chiles toasted and powdered. Wash and sterilize nine 8 oz glass Ball jars along with the rings & lids. Dry completely and set aside. Wash the tomatoes in hot water liberally mixed with vinegar. This ensures that any mold spores are eliminated. Make a slit in the skin and drop the tomatoes into boiling water to separate the peel from the fruit. Puree the peeled fruit and measure out 24 cups. Heat 1/2 the oil, and once it's near smoking, add the mustard & arbol chiles and allow the seeds to sputter and the chiles to brown. Now add the thyme, the chile powder and asafetida, followed by the tomato puree. Now comes the waiting. Once the mix comes to a boil, lower the heat and cook down to about 1/2 the original volume. 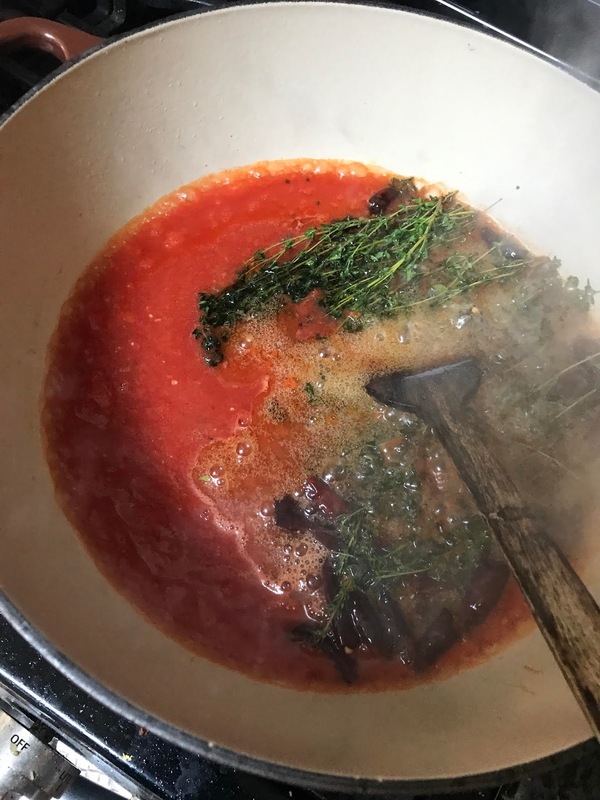 Remove the thyme stalks using a pair of tongs since the leaves would have already dropped off into the tomato mixture by now. Add the salt at this time (this way you have a better way of judging if the salt is sufficient and avoid overdosing). Add the remaining oil and cook down to until the oil begins oozing out of the relish. 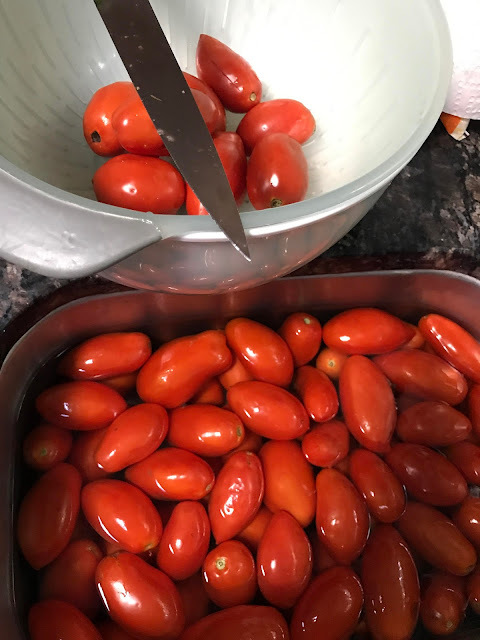 Allow to cool slightly and then using a canning funnel ladle the relish into the glass jars leaving 1/2 an inch of empty space at the top, place the lid after wiping the rim of the jar clean and lightly twist the ring. Place the covered jars in a large deep pot filled with boiling water ensuring that the lids are completely submerged. (there will be bubbles escaping from under the rims of the ring) Can the jars in the boiling water for 20 minutes. Remove the jars and tighten the rings and allow to cool. Ensure that the seal does not 'pop'. This creates the vacuum seal crucial to keeping the relish fresh and intact for long term storage. Allow to cool completely before stashing away for future use. With a good seal on the canned jars, I've managed to keep these jars at room temperature for over a year , and the flavor is just the same as on the day the relish was made. Here's to keeping resolutions! To paraphrase Mrs. Funnybones yet again, Its time to flip that apron around and turn it into a cape and unleash the superhero goddess that resides within all of us. Why don't you post a primer for expat mothers who have no clue about conducting Indian festivals, as they arise? I long to expose my children to the traditions I grew up with, but somehow in the intervening three decades since I left my maternal home, even what I experienced myself, merges into myth. And you know how impossible it is for people in India to put into words what is their way of life :). Would be most grateful. I am a big fan of your fearless approach to cooking and, to be honest, a tad jealous of your family's adventurous palate!